An average sitcom is like a gift from a registry. You know exactly what you’re getting, and it’s exactly what you wanted. There’s satisfaction, but no room for surprise. A great sitcom stays true to its characters but creates surprise through its comic beats and character arcs. Part of its delight is the sheer unexpectedness of it. Like an off-registry gift, maybe it’s something you always wanted, maybe it’s something you never imagined, but it’s always welcome. As recently as last week, I was clamoring for more Winston. “James Wonder” gives us more Winston by giving us less Winston—and more James Wonder, his undercover alter ego. But this episode doesn’t just deliver more Winston. This episode has it all, and if I sound like Stefon, that’s appropriate, because I spent much of the running time stifling my own laughter between clasped hands. ”James Wonder” offers up most of New Girl’s signature moves: Winston pulling an ill-advised prank, Nick Miller in an anxiety spiral, Schmidt “all cranked up!,” a world-class fake name, and Jess passionately pursuing her heart’s desire and beefing it hard. That heart’s desire is the position of principal, soon to be vacated by Genevieve (Lucy Punch). When you cast Lucy Punch, you know what you’re getting, and what you’re getting is comedy a little bit broad for New Girl’s universe, but supremely (and deservedly) confident in delivery. Genevieve is absurd and so is her school, but Punch plays her absurdity with a level aplomb that makes them both more credible and funnier. Ethan Sandler and Adrian Wenner, who introduced Genevieve and Banyan Canyon in the similarly broad “Sam, Again,” also wrote “James Wonder.” They know how to take advantage of Genevieve’s lack of subtlety, which seems to goad Jess’ always over-enthusiastic sense of humor to indecorous depths. Why not? Not, it turns out, because Jess introduces herself with an over-the-top silly accent (“Prince ’enry, pet me corgi!”), then speculates about the sexual pleasures that produced his daughter. Even before she beefs it (“beefed it hard,” Genevieve confirms), Ed had already decided against Jessica Day as principal. He feels she’s too tough on the students, with her DeMathlons and her stringent educational expectations. Winston’s identity also has two edges—uh, sides, Nick, a coin has two sides. He’s been practicing his undercover character on his unsuspecting housemates for some time, but after he unveils the new persona at Banyan Canyon’s parents’ day, James Wonder’s power begins to grow. Soon, James Wonder has his own friends, complete with ’90s hip-hop nicknames, his own career as landscape architect, a son, and a tragic backstory as a widower. (“Yeah, she, um… she got squished.”) Showing off his spec sketches for Ed’s new garden design, Winston confides to Jess, “I don’t remember drawing these” because James Wonder drew them and left them under his pillow. 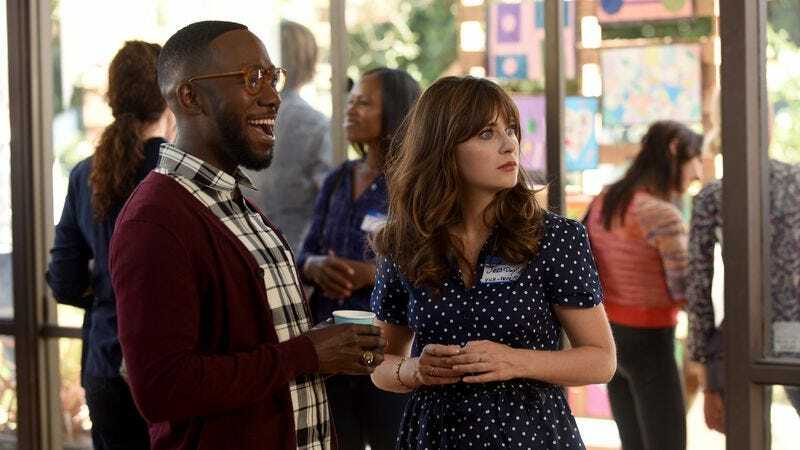 New Girl has plenty of punchlines, but its writing always puts the characters and relationships first. That fidelity to its characters supports all the surprises and laughs along the way. Is it a surprise that Nick gets a tattoo of Schmidt and Cece as his wedding present to them? Sure, but it’s also perfectly in keeping with everything we know about Nick, and especially with everything we know about Drunk Nick. Even more than the big story arcs, it’s the small moments that cement the writers’ familiarity with these people, and the viewers’. Little things convey the show’s continuity of character and its confidence in the audience. When Nick jams both hands into his pocket to hand over his keys to Cece, then laments, “I did it again,” or when he instantly regresses to adolescence in the face of a potential principal (“I didn’t do anything! I didn’t do anything!”), it’s a celebration of Nick’s character and a hat-tip to an audience that embraces the characters’ quirks as completely as the writers do. The power of New Girl—the gift of New Girl—is its bedrock knowledge of and love for its characters. That allows even its surprises to have a welcome tinge of familiarity. Just like real people, Jess, Nick, Winston, Cece, and Schmidt act out similar patterns even when they’re doing new things. Unsurprisingly, Winston will try out his secret identity in the least convenient circumstances, and unsurprisingly he will both beef it, beef it hard, and be overwhelmed by it. Unsurprisingly, Schmidt will give Nick special dispensation to go off-registry, and unsurprisingly Nick will take that opportunity to make a rash, foolhardy gesture. Unsurprisingly, Jess will cook up a ploy to get what she thinks she wants, and unsurprisingly, at the last minute, she’ll think better of selling out. Jess schemes and bargains for the position of principal—just out of her reach since long before Banyan Canyon—but when it’s finally in her grasp, she refuses to buckle to the parental pressure that would clinch it. Jess isn’t the “principal for the parents” that Ed’s hard-won endorsement promises, any more than Winston is James Wonder. “That’s not who I am,” she tells them, her voice ringing out in the parents’ meeting. “I’m not going to be a principal for the parents. I’m going to be a principal for the kids.” She’d rather be true to herself and her students than take the job and short-change the children. “I feel like if you had the ability to pretend to be someone else, you would’ve made that decision a long time ago,” Jess advises Winston early on, and in the last act, she remembers who she is… and reminds the parents, too. She’s the educator who knows their children’s strengths, weaknesses, and needs, and who always congratulates them on their abilities and encourages them to grow. However surprising New Girl can be, it’s always fundamentally the same show about the same people, and that consistency is a gift. Rickety Cricket is married to Bones! To put that in real-world terms, David Hornsby is married to Emily Deschanel, sister of New Girl’s Zooey Deschanel.